Wow – Monday really got away from me. That’s not a fresh wax job. The picture doesn’t do it justice. But that glisten on the floor was everywhere and shows just how humid the room was. This past weekend was a blur too. I was on a purging rampage – in the best possible way. The prior weekend I had gone through one of my dressers and got rid of a ton of clothes and organized the drawers. This weekend I tackled my vanity and my closet. This is part of what Brian and I got out of our bedroom. That’s only part of it. We also went through our hall closet and got rid of a ton of coats, hats, gloves, etc that hadn’t seen the light of day since we moved in here in 2008. In total, I think we had like 12 large garbage bags full of clothes and “stuff” to donate. Next weekend it’s our bookcases. So before I did the workout of carrying those bags out of the house, I had a full week of actual workouts. 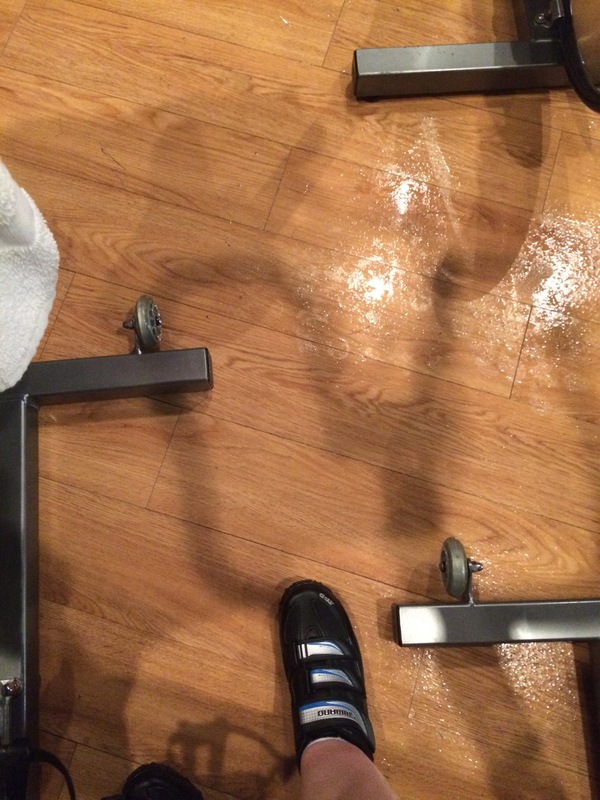 Tuesday – PT Exercises & Spin Class – I had no voice, but whatever I had was not in my chest, so I went and it was fine. Wednesday – 1 Mile Run & Yoga – I had wanted to do 2 miles, but ran out of time before yoga started. Yoga was hard this week – especially after not having it for two weeks. Thursday – Easy 3 Miles – it’s been way too cold to run outside so this was on the treadmill right next to Salt. We were even wearing nearly matching bright yellow shirts. Saturday – Long Run – 4.5 Miles – I had been doing these outside, but I just couldn’t go outside when it was the teens. Plus, I was concerned about ice. So this, I believe was my longest treadmill run ever. I wanted to do 5, but I had to cut it short so I could drive back home and get showered in time to take Charlotte to gym class. Despite running on the treadmill for almost an hour, this was a great run. I’ve been playing around with my speed when I’ve been on the treadmill to mix it up a bit. I’ve been trying to run faster for longer periods of time. (I guess that’s what a tempo run is – duh.) I was really surprised that my average pace ended up at 11:52 – since I do tend to run slower on the treadmill. Thursdays are the days that I am dedicating to really doing some speed work – so maybe I’ll push it a little more this week. Anywho, that’s it for today. I feel like I got a great week of workouts in – and I actually can’t wait to start training next month. Have you started training yet? How are your workouts going? How do you pass the time on treadmill when music and TV just won’t cut it? I can’t think of a more clever title, so a straightforward “2015 Goals” will have to do. There have been a lot of these posts lately, because of New Years and all. So why would I be any different? Last Friday, I read a post on Cynthia’s blog You Signed Up for What?! about how to stick to your fitness goals – and it all reminded me of last year. I had publicly declared on Facebook to run a 5K, found a plan to follow, taped it to my bathroom mirror, and checked off each workout as I completed them. Before I knew it, I loved running and ended the year running a half marathon. So with that kind of success last year, what do I plan on doing in 2015? As of right now, I am registered for 7 races. If you’ve looked at my Races page recently, I’ve listed them there. I’ll probably run a few more 5Ks, so I feel like my year might end up closer to 11 or 12. 1. No Injuries! Specifically to the knees. I’m going to be doing more cross training this year to stay strong. Along with keeping up with the physical therapy exercises I was given. I actually saw my physical therapist at the grocery store a few weeks ago, we chatted briefly and I’m planning a pre-emptive visit next month just to “check in” and get checked out. I also want to work on my core a bit, I might do a 30 day plank challenge or 30 day core challenge to work on this. 2. Drop the last 20 pounds. I’m 20 lbs away from my goal weight. Granted the last quarter of the year I slacked in the exercise department and when I wasn’t slacking there, I was eating all the food (around the holidays). I was able to maintain a 30 lb. weight loss this year, which is the longest I’ve ever kept weight off. It’s going to involve better meal planning (and sticking to the plan). I’m good at planning a weeks worth of healthy meals, but some nights I just don’t want to cook them. Then we end up doing something easy which usually isn’t all that good for us. My husband is on board with cooking a bunch of stuff on Sundays, so at least we are both on the same page. 3. Get Faster! I seem to run the same pace for everything, 5K, half marathon, 10K, whatever, I run the same pace. I don’t know if I need to slow down more for the longer runs or if I need to push myself more on the 5K. Either way, I want to figure it out this year. Ultimately, I want to get my 5K time closer to 30 minutes. 4. More Water. Since I started running, I have been more concerned with staying properly hydrated. Last year I pretty much cut out all soda. I still have one occasionally, but now I stick mostly to coffee, tea, and water. That doesn’t mean that I’m drinking enough though. Helly also posted this as her goal and posted a cool app to track her water intake. Upon searching on the app store, I actually had downloaded one before and deleted it, so I got it back from the cloud and will be tracking my beverage intake. 5. Join a Running Club. Done! I did this last week. I joined the Baltimore Road Runners Club. They do a lot of runs near my house, and the races are cheap! I was kinda intimidated by running clubs thinking everyone would be super fast, so I held out on joining for a long time. But 2015 is a new year and I’m going to branch out a little more. Joining the BRRC will allow me to run a few more races this year and not break the bank. 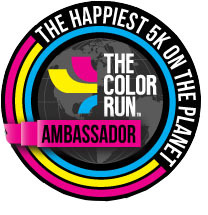 I think the next race they have that I would like to do is in February. 6. Jogging Stroller? This one is still up in the air. Charlotte is 3, so I don’t know how much use I’d get out of it. She doesn’t want to ride in a stroller now as it is. Plus our neighborhood is mighty hilly. I’m not sure I want to be pushing a 30 lb. preschooler around. I’m keeping my eye out on Craigslist and the consignment shops, so we’ll see. If I can get one on the cheap, I may bite the bullet and see if she wants to go on runs with Mommy come spring time. My last goal isn’t for 2015, but a longer term goal. I want to run 40 races by the time I turn 40. No stipulations on distance, just organized races. I turned 35 this past December, so I’ve got until December 2019 to get it done. I am going to count 2014’s races, just so I have a buffer in case of injury. I don’t want to feel pressure to hit the goal and hurt myself. This makes me excited. I have all sorts of ideas for that 40th race, but I think I’ll just get through the next few years first. 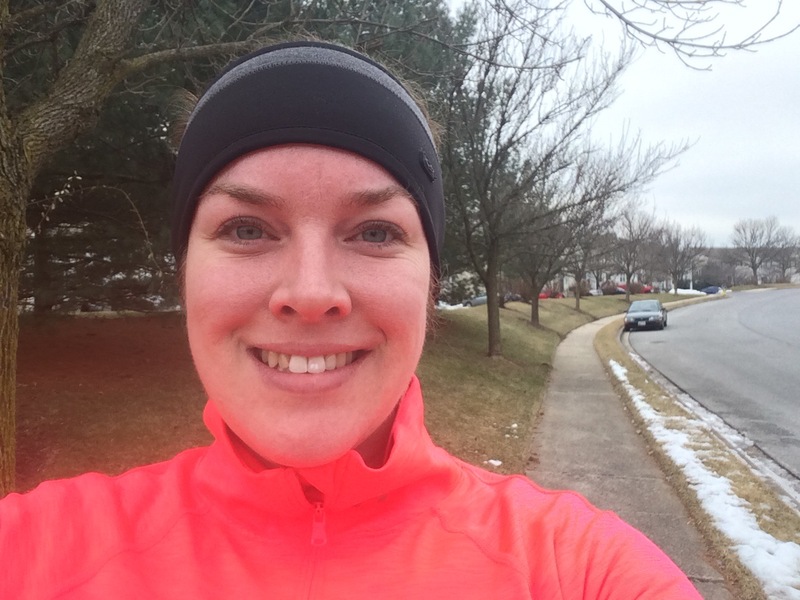 So there you have it – my running goals for 2015 and beyond! I guess I can also share some personal goals too. 1. Redoing our master bedroom. – And by redoing, finally painting it a color we want after living in it for 6 years. Brian really wants a new bed and king size. So I told him he needs to get his stuff organized and we need to rearrange the room. By doing all that, we might as well just go whole hog and redo the bedroom and make it a nice sanctuary – instead of the cluster it is now. I’m doing some purging of my own too, so I’m really looking forward to having a pretty bedroom soon. 2. Finances – Do a budget and stick to it. We are consolidating some debt right now, which makes me happy because we will be able to save some money. I am publicly vowing not to make any frivolous purchases through the end of February. I have enough clothes to get me through the winter, I have enough athletic gear to get me through next year. In the spring I will re-evaluate only because if I make progress on my weight loss goals, I’ll need some new summer clothes. 3. Be Awesome, Give Awesome, Get Awesome. – If anyone out there reads Jen Lancaster, you’ll know that mantra. It was from her book, The Tao of Martha. It’s a manta that she created about her dog that I thought was a way I wanted to live as well. I guess it’s that positive thinking projection kinda thing – but I love the word “awesome” so it spoke to me. I want to be a nicer, more awesome person to be around. I want to give back and share awesomeness with others, and in return, I hope to get some awesomeness back in some shape or form. So there you have it. Those are all my goals for 2015. There are probably more I didn’t list, but they probably aren’t all that interesting. Do you have any similar goals? 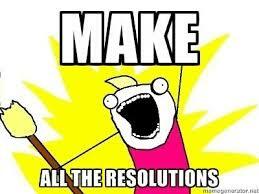 What do you do to try and stick to your resolutions / goals?